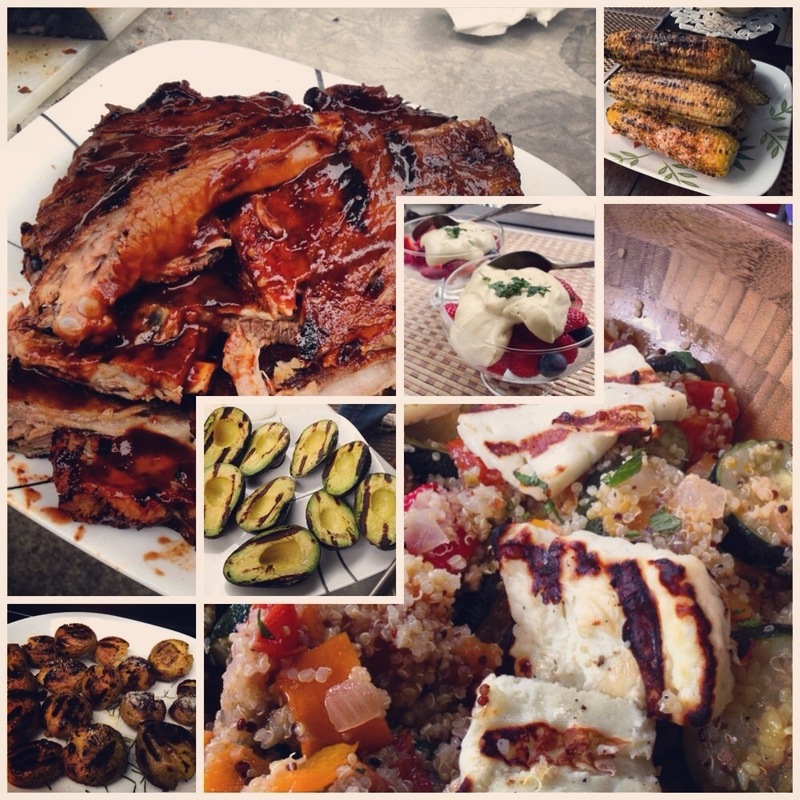 Memorial Day Barbecue [recipes] – Cin Cin, Let's Eat! Hello my fellow food lovers! Hope everyone had a fantastic long weekend with lots of delicious food and great company. Joe and I ate out quite a bit with our friends and watched both Star Trek and Fast & Furious 6 in the theater (two thumbs up for both!). It wasn’t a sunny weekend, in fact, it even rained a little…but that didn’t stop us from firing up the grill and hosted a barbecue for my family. We grilled up some old favorites and some new ones, and dined al fresco under the covered patio (until our neighbor decided to power wash his house and it was just way too loud). Smashed Potatoes // Instead of pan-frying, we coated the smashed potatoes in oil, and onto the grill they went. about 5 minutes on each side until a nice crispy crust formed. Season and sprinkle with cheese and herbs and enjoy. Grilled Avocado // This is our favorite right now! Give it a try! Roasted Mediterranean Vegetable and Halloumi Salad // I made a non-vegetarian version – cooked the quinoa in chicken broth, and mixed in some diced pancetta to the vegetables for roasting. It’s not fig season yet so no figs were added. I would also recommend to dice or julienne the halloumi cheese after grilling because it is very salty, the flavor complemented the salad nicely, but it’d be nicer to get a smaller chunk at a time. Best-Ever Barbecued Ribs // A bold claim, but it was pretty damn perfect. I know everyone has their own preferred method for preparing ribs, some like to boil the ribs first while some like the slow cook method over the grill. Roasting the ribs in the oven was so easy and I didn’t have to keep an eye on them constantly, plus the foil wrapped method made for very easy clean up. I used the barbecue sauce from Trader Joe’s (mild and sweet flavors) and the reserved meat juice really enhanced the flavor of the sauce. We would’ve preferred ribs with a bit more heat and kick, but made them mild instead so our two year old nieces can enjoy them too. Zabaglione with Strawberries // I folded in unsweetened whipped cream to the zabaglione, and added a splash of vanilla extract and some lemon zest. Spooned the mixture over a mixture of strawberries, blueberries, and raspberries. All that was missing was a nice glass of port. We washed these all down with some watermelon faux-jito (added more watermelon puree and less grape juice) and some Mission Blond from Mission Brewery. Great pairings! I could totally go for some zabaglione right now. Gotta try the faux-jito!